The lightest, loveliest scarf of all! A froth of sheer, stretch lace in a vibrant red, edged in dainty droplet fringe along two sides. 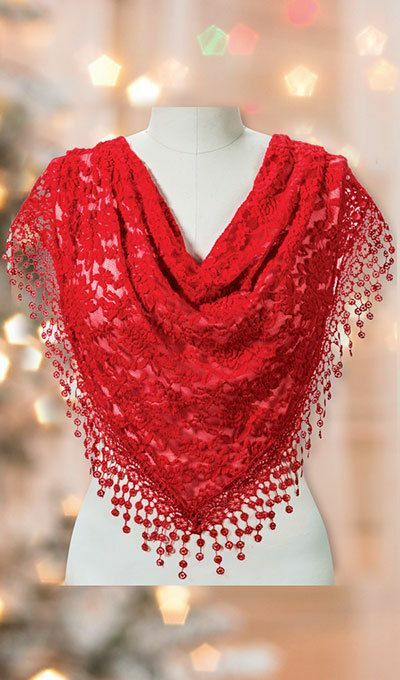 This Red Lace Droplet Scarf has a versatile triangle shape in polyester. Gentle wash. Imported. 60" x 20". Hurry! Quantities are limited! THIS WAS A GIFT.. SHE ABSOULETY LOVED IT!!! !